BBC News reports that Google has started to allow users to download public domain books as PDF files in Google Book Search. To find books available for download like Dante's Divina Comedia, you need to restrict the search to full view books, but not all the results will have the download option. HTML view (plain text) should follow naturally for public domain books, as the downloaded PDF contains only the scanned pages, without OCR. Google should also improve the way books are read online, by optimizing page view for any resolution. 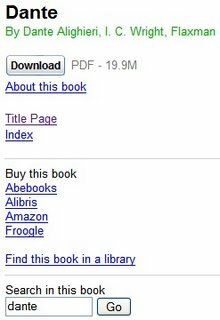 The download option for public domain books will be followed shortly by an easier way to buy books directly from Google. Project Gutenberg offers 19,000 free ebooks, but their content is not searchable online. The books can be downloaded as text files. are our gateways to the past, representing a wealth of history, culture and knowledge that's often difficult to discover. publisher to a library and finally to you." just found the eBook Searchr, a nice ebooks search engine based on Google CSE. The index of ebook sites they search is pretty large, more than 340 as per the last update.